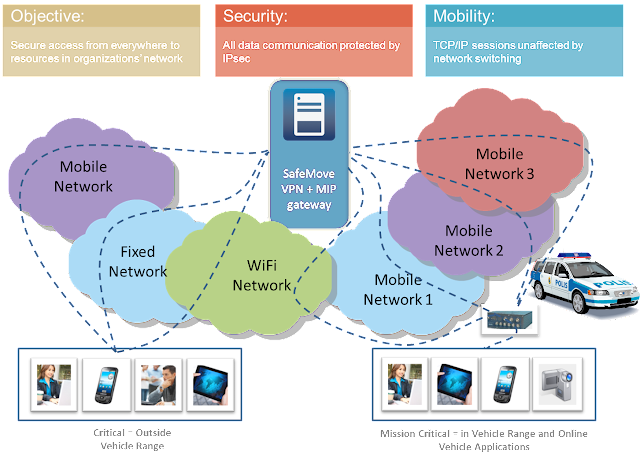 A most recent killer application for critical mobile connectivity in policing is to have a system with VPN client based systems used in the laptops or other smart devices and a router solution in the vehicle. In this blog I have summarized some demands and key benefits of this approach. In this approach the VPN client in the mobile device is able to use one or two links towards the network and is an excellent solution whenever the vehicle is not nearby. The requirements for the VPN solution include solid security, seamless connectivity, session persistence as well as seamless roaming between networks. Many mobile solutions fail to deliver the anticipated benefits due to ease of use and connectivity issues. A specially designed mobile VPN is designed to provide a secure, LAN-like user experience. As this might be enough for many solutions officers are using today, it is not enough alone for mission critical applications. A seamless functionality with a vehicle router whenever near, gives an excellent combination of critical connectivity from the devices and mission critical connectivity for all online vehicle systems. For many law enforcement applications it is mission critical to have a constant flow of information on the field. Mobile multi-channel routers provide a reliable, fast, and secure broadband connection between the vehicles and the command center for mission critical needs. Goodmill w24e is the first router in the world to provide seamless and reliable switching between several different broadband data networks using technologies like LTE, 3G HSPA, CDMA2000/450, WiFi, WiMAX and TETRA. In case of a connection failure the solution immediately reroutes the traffic through another network. This ensures reliable connectivity even when the vehicles are constantly on the move. The actual quality of the available broadband networks might be a surprise to many officers. The dynamic nature of the networks, including future dedicated networks, demands a solution that combines networks. This is presented from actual tests run data collected from a moving vehicle. Criminal records, vehicle databases, medical databases etc. Information sharing between jurisdictions is a valuable tool for increasing the efficiency and effectiveness of Police operations. These important applications are only possible to realize with broadband connectivity ensured by hybrid network approach provided by advanced VPN client software, multichannel routers and supporting backend solutions.